The AS3990/91 UHF reader chip is the 1st Generation integrated analog front-end and data framing system for a 900MHz RFID reader system. Built-in programming options make it suitable for a wide range of applications in UHF RFID systems. 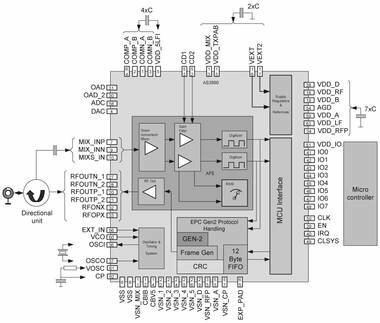 Designed to simplify the design and implementation of an EPC Class1 Gen2 reader, this IC requires only a standard 8-Bit microcontroller with minimal other components.